Plants glabrous or moderately pubescent in distal parts, often becoming glabrescent at maturity. Stems usually erect, green or reddish purple, branched, mainly in inflorescences, to nearly simple proximally, 0.4-2(-2.5) m, coarse. Leaves: petiole of distal leaves equaling or slightly shorter than blade, becoming longer proximally; blade rhombic-ovate to broadly lanceolate 4-12 × 2-7 cm, larger in robust plants, base cuneate to broadly cuneate, narrowly cuneate in distal leaves, margins entire, apex cuneate to obtuse or indistinctly emarginate, mucronulate. Inflorescences predominantly terminal, often with few spikes at distal axils stiff, erect, dark red, purple, or deep beet-red, less commonly yellowish or greenish, leafless at least in distal part, usually robust. Bracts lanceolate to linear-subulate, subspinescent, 3-6(-8) mm, to 2 times as long as tepals, rigid. Pistillate flowers: tepals usually 5, proximal ones lanceolate, distal ones narrowly ovate-elliptic to elliptic, not clawed, unequal to occasionally subequal, 1.3-3(-3.5) mm, apex acute; style branches spreading; stigmas 3. Staminate flowers clustered at tips of inflorescence branches; tepals 3-5; stamens 3-5. Utricles compressed-ovoid to elongate-ovoid, (1.5-)2-3 mm, equaling tepals or nearly so, smooth or lid slightly rugose or minutely verrucose, dehiscence regularly circumscissile. Seeds white, ivory, pinkish white, or black to dark reddish brown, subglobose to lenticular, 1-1.4 mm diam., smooth, shiny. Flowering summer-fall. Near places of cultivation; Ariz., Mass., Mich., Nebr., N.Mex., N.Y., Tex., Utah, W.Va., Wis.; cultivated widely. 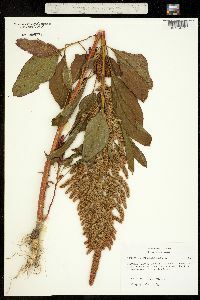 Amaranthus hypochondriacus and its hybrids are widely cultivated as ornamental, pseudocereal, and fodder crops in many tropical to warm-temperate regions of the world. Occasionally, A. hypochondriacus occurs as escapes near the places of cultivation; there are no reliable reports of its successful naturalization in the flora area. 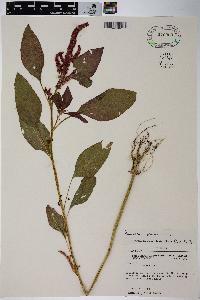 The wild progenitor of Amaranthus hypochondriacus seems to be A. powellii (J. D. Sauer 1967b); hybridization with other cultivated taxa (e.g., A. cruentus) probably also played some role. The initial cultivated form probably emerged in southwestern North America, within the original range of native A. powellii. Cult. ornamental and grain amaranth, apparently derived from A. powellii; infl large and showy, stiffly erect, mostly bright red or bright yellow in life, or sometimes bright green; bracts with rather strong midrib, about equaling the style-branches, these spreading from the thickened base; sep all over 2 mm, nearly equaling the fr, all lanceolate, acute; seeds of ornamental forms generally dark brown, of grain forms mostly pale ivory. Amer. cultigen, originally cult. for grain, now much more commonly so in the Old World than in the New; widely cult. as an ornamental, and occasionally escaping or persistent, but scarcely established in our range.